Home Beers Wagner Valley Brewing Co.
Oatmeal Stout | Wagner Valley Brewing Co.
Mahogany colored with a frothy light brown head that needs a vigorous pour to rise up, and settles out quickly to a low cap. Aroma of roasty malt and cocoa. Flavor of dark malt, sweet cocoa, some smoke and leather, mild metallic note, finishes with some roast coffee notes, hints of root beer. Low bitterness. Full mouthfeel, even carbonation, finishes a bit dry and tannic. Tasty beer, very drinkable. The beer pours a deep, dark black color with a thick frothy tan/brown head that slowly fades to lacing. The aroma is good. It has a dark, earthy, black malt scent with a dry oatmeal aroma. It has a wonderful roasted malt character. The taste is decent. It has a very dry, black malt flavor that goes down easy and finishes a little light for me. It's got one hell of a roasted malt character, but that's about it. The mouthfeel is decent also. It is a full bodied beer with adequate carbonation. This is a pretty good OS, but there plenty better out there. It's a good drinker regardless. Poured a deep brown, almost black hue with a one and a half finger light brown creamy head. There was very good retention and lacing. The smell featured a rich burnt grain with highlights of coffee and cocoa. Some hints of sweet lactose as well. The taste consisted of a robust burnt smokey grain with hints of dark chocolate and strong coffee. The mouthfeel was of average fullness with a rather dry finish. A softer finish would have improved the mouthfeel. Overall a top level oatmeal stout. High drinkability. Poured briskly into a pint glass to yield a half inch dark tan head that slowly faded as it laced the glass. Dark crystal and roasted malts prevail in the aroma. Opaque dark mahogany hue doesn't reveal any particle size as far as carbonation, which is soft. Grains and specialty malts begin the flavor profile that follows through to mix nicely with a mild bitterness. Flavors remain as it forms a chewy sensation on the palate that lingers. A sweetness/ bitterness like what you would get from dark chocolate makes this a nice dessert beer. Medium body, dry texture and genuine flavor all add up to form a nice stout that is truly enjoyable ! A-Deep, dark black/brown with a thin tan head that reduced to a thin cap and left spotty lace. S-Sweet milk chocolate goodness with light roasted malt, a touch of coffee all ending with a flourish of earthy hop bitterness. T-Roasted malt and milk chocolate meld nicely with dank coffee and earthy hops. Becomes rather astringent with warming. M-Medium body, smooth and silky soft not overly robust but rather mellow and easy going. D-Pleasant, tasty and non-offensive. Solid and easy to drink, nothing wrong with this one but it is rather tame and could use a kick in the pants to ramp things up a notch. A very enjoyable, if not a bit sweet, oatmeal stout. Beer pours a generous 2cm tall head of tan-colored foam that settles, in under one minute, to a thin ring around the glass and a wispy island of foam atop the body of the beer. Lacing is minimal, a few small dots and lines cling to the insides of the glass. The body is a dark brown to black color, opaque, with sluggish carbonation appearing just at the top of the body. Very pleasant aroma of mild, smooth, and sweet roasted malts with a high level of oats. Less present, but discernible, are vanilla, milk chocolate, and very mild unground, roasted coffee beans, which round out the scents present. Taste is of smooth oat and acrid roasted malt sweetness blended with milk chocolate and faint vanilla and coffee bean flavors: the result is a roasted and chocolate malt character blended with oat sweetness, . Front of palate picks up mild roasted malts, sweet oat and pale malt, modest milk chocolate and vanilla. Mid-palate of smooth oat sweetness and moderately roasted malts joined to milk chocolate, vanilla, and faint unground coffee beans. Back of palate finds mild roasted malt, oat sweetness, and vanilla. Aftertaste is of slightly acrid roasted malt with very faint vanilla and coffee bean undertones. Beer is medium-bodied with medium to medium-low levels of carbonation, resulting in a smooth, gently foaming mouthfeel as the beer moves along the palate. Closes semi-dry, with modest residual stickiness on the palate. Appearance: Opaque brown/black. Thin tan head that dissipated quickly. No lacing left on glass when gone. Smell: Roasted malt, sweet molasses. Taste: Roasted malt, espresso. Dry finish. Mouthfeel: Watery, quite thin for a stout. Drinkability: This was an OK stout. Expected a richer, creamier mouthfeel for an oatmeal stout. Wouldn't buy it again. Pitch black. Chocolate Mousse colored head, rich and creamy looking. Nice. Fades to a ring rather quickly though. Aroma is of bitter chocolate, sweet rich caramel, roasted malts. Taste is a mix of chocolate and coffee bitterness, some hop spice, and a sweet caramel smoothness. Finishes with a nice bitter hop bite. Really a nice complex oatmeal stout. Big bodied, rich and creamy in the mouth. A nice one even on a moderately hot summer day. Pours black with the slightest ruby tint at the bottom of the glass when held to the light. A light brown head that looked promising for a few seconds, descends to a vanishing thin swirling island. Vanishing lace slides down the glass. The smell is of roasted coffee with chocolatey maltiness and an earthy, slightly tart backing. The taste is roasty and dry - sligtly metallic to start, but it soon fades and a rich, chocolatey sweet maltiness and a touch of roast come through. A touch of sour milk and earthy hops emerge in the finish, though the dark maltiness holds up, as well. It is on the fuller side of medium-bodied. The carbonation is on the higher side of the style, putting something of a dent in the creaminess. While I can't honestly say it's the richest, creamiest, smoothest oatmeal stout out there, I can say that it is enjoyable with a nice amount of dark maltiness, and a fairly complex balance. Well-done, overall! Pours completely black with a good sized dark tan/brownish head. Nose is malty, molasses, chocolate, and some coffee tones. Flavor is a bit intense. Thick, slightly roasted, molasses tones. Lots of malts. Roasted edges really stay with you. Feel is smooth on liquid and lower on carbonation. I like this one. Deep and robust. Thanks to FooFaa for giving me a bottle of this. Poured into a Sam Adams glass on 3/31/10. A - Vigorous pour yielded more than two full fingers of tan froth, under which displayed a thick, deep dark brown liquid. The head gradually diminished into a creamy retention and dispersed some stringy lacing around the glass. S - Sweet up front with a combination of chocolate and milky lactic notes with a hint of roasted malt, the latter imparting a faint coffee presence. A hint of earthy bitterness and a more substantial nutty character is also apparent. T - Lightly toasted oats, milk chocolate and medium roasted coffee comprise the initial flavor, giving the first taste a fairly full, robust character. In the backend, a moderate earthy hop presence and coffee notes add bitterness as the malt character becomes more nutty and slightly astringent. M - Solid medium body with an oily texture and soft carbonation, resulting in a pleasant, slightly chewy mouthfeel. Finishes with a fair amount of dry bitterness on the palate accompanied by a hint of sweetness. D - Another solid brew from Wagner Valley. I like an oatmeal stout with a robust mouthfeel and some bitterness, and this one delivered. Two for two so far from this little brewery. Thanks to Rageagainst123 for the trade! Appearance: It's a stout. Dark black with a finger of off white head that turns to a thin layer of foam as you go. Smell: Creamy roasted coffee along with nice malt and chocolate scents. Taste: Just like the nose. Very creamy and good sweet. The flavors all mingle very nicely. Mouthfeel: Good thickness and little carbonation, which is to be expected. Very smooth, and the taste coats the mouth well. There is the slightest warmth as you go. Drinkability: Very good oatmeal stout. Gets all the basics right and is very easy to drink. Low ABV and high smoothness makes this a very drinkable beer. Poured from a 12oz bottle into my Wagner Valley pint glass. A: Pours a deep black color, with very little light shining through. 2 fingers of creamy frothy tan head. This beer looks yummy. Not much lacing going on here. S: Sweet, roasty, nutty, coffee and some chocolate notes. Very pleasant. T: Sweet malts up front and then comes the roastiness. Finishes slightly bitter but roasty throughout. Very solid flavor. Enjoyable. M: Moderate/heavy body with light carbonation. Lingering roastiness throughout. Overall this is a very solid and enjoyable Oatmeal stout. One of Wagner Valley's better offerings. Another new one I was able to receive as an outstanding extra recently. Served chilled and poured into a pint glass, this one was consumed on 10/22/2009. The pour was wonderful, rich dark brown in color with a nice tight head of tan on top. Settled down nicely with minimal side lacing. Aroma of sweet lactose sugar, notes of cookie dough and molasses and a light hint of coffee and cocoa. Rich and about what I would have expected given the style. As I go in for a sip, smooth, even flavor then comes across rapidly. Rich notes of vanilla, cocoa and a touch of coffee all come together quite nicely and really quite fully to give me a nice warm feeling. Lightly dry finish, but definitely sweet as a long lasting taste of light chocolate is left on the tongue for a good few moments after the final sip. Overall a very solid stout here. Definitely something I would be going for again here any day. Light and session able here with a very nice overall feel and flavor. I would have to recommend this one as a nice and solid offering the best of all worlds. My wife brought this back from Albany on a trip to NYC last May. Poured from a 355ml. bottle. Smell: Lots of chocolate and cocoa powder with a hint of fruit. Very mellow. Taste: Unnecessarily harsh and bitter. Hardly anything to taste except a hint of chocolate. Not pleasant. Mouthfeel: Chalky & abrasive. This is not good at all. Drinkability: Uh, not at all. A few sips is all i could muster. Overall: I believe this is infected as it was hard to choke down. Too bad as i love oatmeal stouts. Be careful. I like the beers from Wagner Vallley, this is one their 3 best. Poured into a pint glass from a growler. A: Dark, dark, and even more dark. No light through this beer. Thick foamy three finger head which took a long time to settle. Great lacing. S: Most prevalent would be roasted coffee beans. T: Very coffee-nutty like flavor with a little lingering sweetness, perhaps molasses. M: Low carbonation, very smooth. D: I love this beer, very easy going down. With it being low on alcohol very easy to drink a lot of it. This oatmeal stout ranks near the top of my list for this style of beer. Good full flavors and not too overpowering. 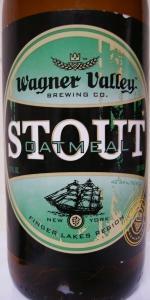 Oatmeal Stout from Wagner Valley Brewing Co.